Nourish your inner child with these superfood popsicles. Let’s flashback to childhood: You’re nine years old, chilling on the curbside with your BFF, and you’ve both got Rocket Pops in your hands and cherry-flavored juice dribbling down your cheeks. Those were the days. While we might have grown up a bit, our love for popsicles has stayed the same. And while we may be tempted by the ice cream truck with its gumball-dotted treats, there’s a healthier (and equally delicious) way to consume your favorite frozen treats. All of the recipes below contain superfoods, making them popsicles that practically count as a vitamin. Whip them up for a party, for your friends, or enjoy all your on. The curbside is waiting. With only two ingredients, these strawberry and kefir popsicles are easy to throw together when you’ve got that frozen treat craving. Kefir contains about 30 different strains of bacteria and yeast, making it a fantastic source of probiotics, even more so than yogurt. Kefir has also shown evidence to help with digestive issues, and can often be consumed by those with a dairy sensitivity. The strawberries are sweet and jam-packed with antioxidants. How can you go wrong? If you like chia pudding, you’ll adore these popsicles. This recipe takes the trendy snack and transforms it into a frozen treat. Chia seeds are absolutely amazing for you; they provide a huge dose of Omega-3 fatty acids and a good chunk of dietary fiber. They also help stimulate your metabolism and raise energy levels, making these popsicles a cool and creamy breakfast. With the addition of kiwi and coconut milk, you get even more of a health whammy, as well as a fun fruity and tropical flavor. Fudgesicles: they’re creamy, delicious, and now they’re good for you. These vegan, dairy/gluten/sugar-free popsicles are made with avocado, cocoa powder, and protein powder. They’ve still got the luxurious, cold richness of a traditional fudgesicle, but with the added bonus of healthy fats and protein. Whip up a batch and store them in the freezer for when you need a post-workout cool down. Do you remember how enchanting blue-colored treats were when you were a kid? Whether it was a popsicle or Sour Patch Kid, the “blue raspberry” flavor caught the attention of kids everywhere. With this recipe, you can experience some childhood nostalgia while getting a hefty dose of chlorophyll. The blue comes from the spirulina, a blue-green algae that possesses a strong source of protein and 22 amino acids. Coconut water and lemon add a refreshing sweetness, making this blue pop a tangy treat sure to bring out the child in you. The rainbow popsicles were a staple of childhood. Whether it be the combination of colors or flavors, there’s something so whimsical about a multicolored popsicle. This recipe takes your childhood staple to a whole new level by using turmeric, mango, matcha, strawberries, spirulina, blueberries, and raspberries. More than half of these ingredients are superfoods, and the end result is a tasty and colorful frozen treat that reminds us all of the good ol’ days. The combination of cucumber and mint creates a refreshing flavor perfect for those sweaty summer days. The green tea is loaded with polyphenols, which function as antioxidants, improve brain function, increase metabolism, and can help decrease your chances of contracting various mental and physical diseases. Grab a ready-made one from the freezer in place of your morning tea when things start to heat up. 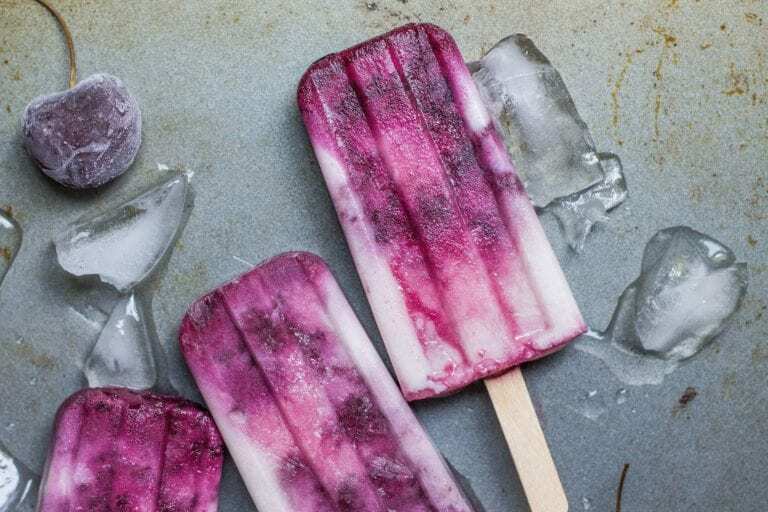 We love chia seeds in our popsicles so much that we had to add another recipe. This adds in the succulent flavors of summer peaches alongside maca powder. Maca is a root of the radish family, bursting with all sorts of health benefits. Just one teaspoon can help increase energy, stimulate libido, aid menstrual issues, and balance mood swings. Sounds like a great reason to visit the orchard this summer.